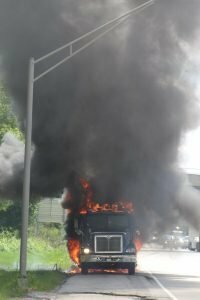 At 1:05pm Shrewsbury Volunteers were disptached to a reported vehicle fire on Interstate 83 NB at the Welcome Center rest area. 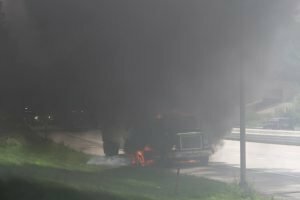 Engines 61-1 and 61-2 responded and enroute was advised there have been several calls reporting the tractor fully involved. A request was made for another engine and two large capacity tankers. 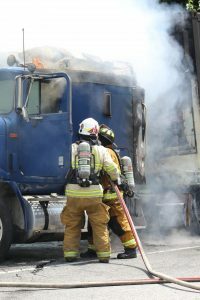 Engine 61-2 arrived and found the tractor tires fully invoved as well as the cab and the front of the trailer. Attack lines were pulled and fire attack began. 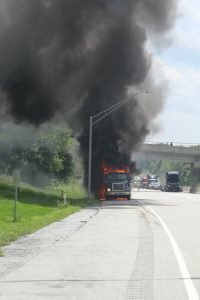 A bystander, who was there before the fire department, advised he did not see the driver at any time and it was possible he was in the sleeper section of the cab. Crews made immediate entry into the cab with another attack line and determined no one was inside. 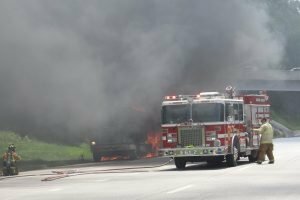 Additional personnel and apparatus from Rose Fire Co, Maryland Line Volunteers, Loganville, Glen Rock and Eureka Fire Departments assisted. High heat indexes were a concern for firefighters and EMS from Rose Fire Co. monitored firefighters as they exited fire attack assignments. The trailer was opened to find it fully loaded with pallets of chocolate bars. Crews made there way inside the trailer and extinguished fire that was inside. 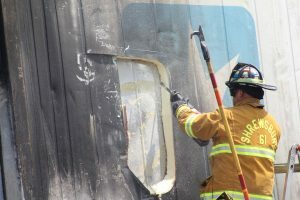 Additionally, crews cut a hole in the side of the trailer so water could be better placed for extinguishment. 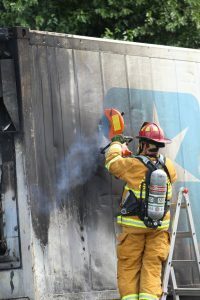 The fire was extinguished and fire deparment personnel assisted with clean up and helping the towing agency. Gordon’s Towing from Stewartstown provided a heavy duty wrecker as well as several other vehicles to take the trailer and tractor off the interstate. Initially the entire northbound lanes of Interstate 83 were closed due to fire attack. 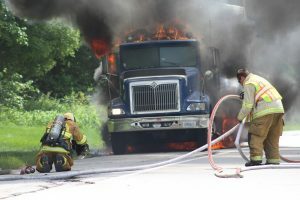 Once it was safe to do so equipment was repositioned and one lane of traffic was able to pass by. Shrewsbury Volunteers wish to thank all mutual aid companies who assisted. Thank you to Leo Fire Co. of Red Lion for transferring their rescue to Station 61 and covering the district while we were comitted. Station 61 equipment was back in quarters by 4:30pm. 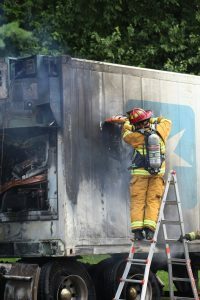 While personnel were beginning the process of reloading hoses, filling air cylinders and cleaning equipment used on the tractor trailer fire we were dispatched to Hopewell Township for a reported fire alarm in an industrial building. Engine 61-1 responded immediately and enroute was advised workers on the scene have water flowing. Engine 61-1 arrived along with Traffic 54. Investigation revealed a sprinkler head activated in a generator room. Crews made access to the room and determined the sprinkler head activated due to heat of the machinery operating in the enclosed room. The system was shut down for that room and electricity shut down. Workers will clean up the water damage. All fire department units cleared. Station 61 personnel finally made it back to the station and made all units ready for the next call.